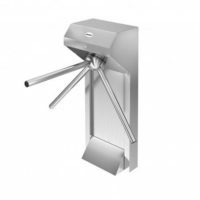 Access management devices – turnstiles, designed to manage big visitor flows. nSoft is the only official Lithuanian supplier of Cominfo, leading manufacturer in eastern Europe, turnstiles and gates. On client request we assemble the equipment with cohesive software for access management, created by nSoft. Cominfo turnstiles and gates are distinguished by exceptionally high quality, great price and quality ratio as well as reliable electric motors and universally programmable microchips – controllers. Turnstile motors do not require constant maintenance and are intended for intensive workloads in indoor and extreme outdoor weather conditions. Available options are: stainless-steel frame, tempered glass wings, as well as anticorrosion agent coated or galvanized and painted using RAL color pallet frames. Cominfo turnstiles, provided by nSoft, are used in Lithuania’s most major recreation centers – – Švyturys Klaipėda arena, LFF stadium (Vėtra), Impuls network of fitness clubs and others. 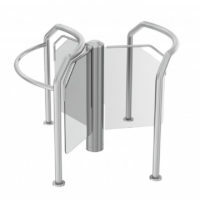 Popular turnstile series is meant for universal access management system. Model ir modification diversity makes it possible to adapt the turnstile to defined needs and desires. These turnstiles work well with small people traffic as well as high traffic attracting objects. 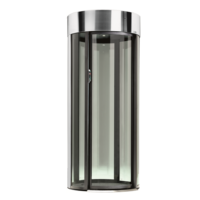 ROUND turnstile series is distinguished by clearly elegant and rational style, wide passage, high comfort and security ratings. These access management devices are suitable for lobbies and halls, where design and quality are mandatory. 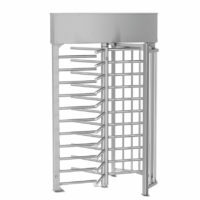 REXON full-height turnstiles ensures the highest security level in manless secure objects. These full height turnstiles are distinguished by solid and reliable construction, used in places where fully automated traffic separation and access control is required. Security Portals are a form of access control that guarantees a special security standard. Transparent revolting doors have a small footprint, but a spacious and comfortable transit. The stylish design ensures they don’t look out of place in even the most modern environments.